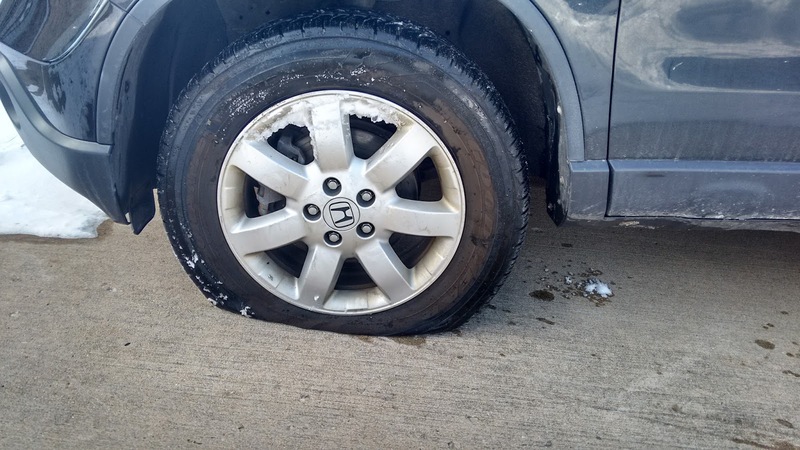 TWTW: January 18th through 24th 2016 CAR BROKEN!! I spent last week trying to get my work computer to function properly so I could do my job. I am happy to report that it worked without a problem the entire shortened work week. On Tuesday, I went to my local favorite taqueria, El Charro. I schedule my Wednesday trip as my one lunch I allow my self to eat out a week. I knew I wouldn’t make it on Wednesday so I went a day early. A few weeks ago his cook quit so he has been making all the food himself. Being a slow day he didn’t have his waitress their either. He spent the entire time I ate talking my ear off about how he wanted to buy a small farm to have cows and chickens. I think he is lonely without his cook. Friday morning I got up and went out to my car to drive to work. It didn’t take me long to realize something wasn’t right. My front driver tire had become completely flat over night. I got a ride to work. The windchill was seven F so I didn’t want to be outside fumbling with the spare. The warning brake light had also been coming on so I already wasn’t to sure about driving. Also on Friday my W-2 from my employer became available. That same day I did my taxes electronically and it got accepted by the IRS. I should see my refund in a few weeks if not sooner. This really does highlight my changing relationship with money. In the past I have waited until the week of April 15th to do my taxes. I have always gotten money back. It has only been the last two years that I have done my taxes as soon as possible so I could get my refund early. Just another symptom of my just not really noticing money. Oh and that refund would be spent as soon as it hit the bank account. Who am I kidding, that refund was spent well before it ever got to me.